Love animals? At our Jungle party, hosted by a Lion and/or Monkey, you will meet many of them. Different animals come to your party and bring along their favourite games. Can you jump like a monkey? Hiss like a snake? Crawl like a crocodile? 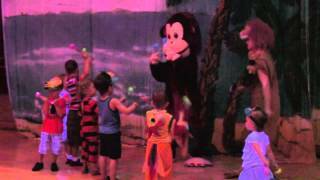 After an adventure through the Jungle, our animals will teach kids their favourite animal dance! The birthday child and family will be greeted upon their arrival to the Fairyland Theatre and welcomed to enter the party hall. The birthday child will be taken to the dressing room where they can dress up as their favourite character. If you choose to have a dress up party your guests will be welcomed to the dressing room to choose their costume as well. Following dress up all kids will be invited to get their face painting. Face painting is for about 15 to 20 minutes while all kids gather for the party. About 15 to 20 minutes into the party, the entertainment program will begin. All parents are welcome to stay and watch. The entertainment program is about 40 to 45 minutes in length. At the start of the entertainment program, the main character will make a grand entrance, greet the kids and wish our birthday child a very happy birthday. The entertainment program is filled with many themed games and activities. The program will also be accompanied with theme related props, light effects(North York location only), music and video projections(North York location only). After the entertainment program, photo opportunity with the main character will be available. Following the photos, eating time will begin. Eating time will start with pizza and will be approximately 20 minutes in length. After pizza, a beautifully decorated cake will be brought out and a “Happy Birthday” song will be sung together with the guests. If there is time left after the kids have finished eating and before it is time to wrap up, kids will be welcomed to have a mini dance party or play in the play area decorated in Princess theme (North York location only). Closer to end of the party each child will receive a good bye hug from the main character. The main character will arrive to your party and greet the birthday child and his/her friends. They will take a moment to remind everyone about the special day and the reason we have all gathered to celebrate. The main character will organize many fun, themed games and activates accompanied with music and themed props. The entertainment program is about 45 minutes in length. After the entertainment program kids will have the opportunity to take pictures with the main character and get their face painting. At the end of the party, each child will receive a good buy hug from the main character.